The flip side of the coin is that you can always ask your parents if they are retired, how much they need. If they are financially organized, they can tell you how much they need and where the money is going. There is a section of retirement that is very easy to estimate and that’s the fixed cost of retirement. You can use your current cost of living as an estimation. If you are young, use your parent’s estimation as a cost. Mortgage Payments – Hopefully those are done. It’s usually the intention since your income goes down. If you don’t own a home than you’ll have rental payments to make and that can add up to a large amount. Condo Fees – If you own a place with some sort of management, you’ll have a condo fee that you need to include. 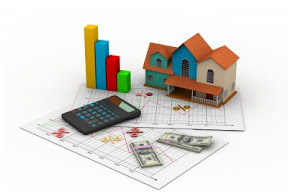 Property Tax – A fixed annual cost of homeownership. Utility Bill – A fixed annual cost of homeownership. Television & Internet – A fixed monthly cost. Personally, I would find it pretty hard to live without the internet but it can be easy to cut off the television if you were so inclined. Home Insurance – If you own your place, you SHOULD have insurance and it’s another cost added on to your annual retirement cost. Can Insurance – Depending on the number of vehicles, this might add up. Cost of insurance is very different based on your location. Life Insurance – This is a fixed cost but you might not need it anymore but then again, your estate planning might require it. Pet Food – If you have pets, the food is a pretty fixed cost along with vaccination. You can use the Financial Budget Google Template I made to help you out assessing your costs. Here is where I am in today’s price. 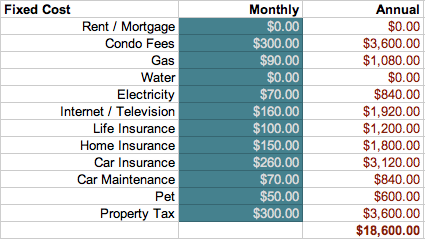 I added a condo fee just in case we decide to downsize. It’s more of a preventive measure. We have a few pets so our cost is higher than others unless you have a really large dog. Groceries – How much will it be for two of you? Restaurants – Will you be eating out more or less? Fuel – How much traveling by car will you be doing? and will your vehicle be gas efficient? Here is what my fixed cost looks like with inflation. I kept the inflation slightly lower for the fixed cost as I have not seen it use a 2% or 3%. I have used 1.5%. Non-fixed cost can grow at a faster pace than 2% or 3% though. That table brings me up to age 90 which would be a remarkable achievement based on the lifetime averages. As you can see, you either need a massive portfolio when you decide to retire if you stop growing it and if your portfolio goes into safety mode. I added the last column to highlight what an income portfolio can do. Since the inflation increases your fixed cost, your required income needs to grow as well but if you are still invested in dividend growers, it can offset the inflation. That’s why I find Dividend Aristocrats a perfect fit due to their track record of increasing dividends.